OutCo, a cannabis cultivation, manufacturing and retail company in Southern California, marked a milestone May 7: It harvested its final crop grown under high-pressure sodium lights. The company needed a couple of years to transition from the powerful but power-sucking HPS lights used by most commercial growers today to more expensive – but more efficient – LED lights. The switch was part of OutCo’s effort to be greener and more cost efficient. “True sustainability efforts will be at the core of all businesses going forward, including cannabis,” said Allison Justice, OutCo’s director of cultivation. In an age of plunging wholesale cannabis prices, sustainability is as much – or more – about cutting costs to survive as it is about recycling and reducing carbon footprints to be green. “Everybody is dealing with such thin margins, so everyone is looking to be sustainable in terms of, ‘Will I be in business in five years?’” said Casey Rivero, cultivation manager at Yerba Buena in Hillsboro, Oregon. 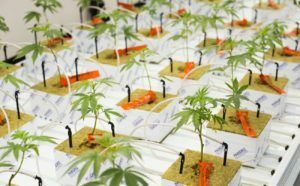 While companies like OutCo and Yerba Buena are ahead of the curve, a growing number of cultivation operations are adopting sustainable growing technologies and techniques, experts said. “My gut feeling is that the industry is generally getting more efficient on a production basis and facility basis,” said Derek Smith, executive director of the Resource Innovation Institute in Portland, Oregon, a nonprofit research organization that promotes energy and water conservation in the cannabis industry. To successfully transition to a sustainable cultivation model takes not only ambition but a new way of thinking. Growers generally measure the efficiency of their operations in terms of how many grams they can produce per square foot. However, that must – and will – change, predicted Eli McLean, a cultivation consultant in Salem, Oregon. In other words, being green is good for your bottom line. I know how you can tick three of four of those criteria just by using Dominion Organics Nutrients. They are sustainably produced, highly engineered for Cannabis, reduce warer consumption by the plants relative to syntheric nutrients and boost pest figting capacity! Dominion Organics from Ferndale Washington. I use these nutes but am not affiliated with the company in any way. Just trying to pass the word as a eco-conscience advocate myself! It would be nice if within these types of articles, actual performance improvement date was included. While touting sustainability, the challenge also comes with the need for efficiency as well as low cost – high quality performance, something we have not seen in the LED units we have tested although the Black Dog LED got pretty close. In the end there is no wrong way to grow Cannabis but there are methods and environments to consider in risk mitigation as well as efficiency. Good fortune with your move to LED lights noting a nice follow up article would disclose actual results as well. Consider depreciating these lights rapidly. It’s technology. It’s silicon. Next years’ lights will be twice as good at half the price. That’s bound to affect purchase decisions & electric bills.